I’ve been sipping bone broth regularly for over a year now and see that it has become trendy now in lots of health circles. I know this is controversial for those of us wanting to turn away from animal products but still feel like the benefits are significant enough to at least report my experience and research results of bone broth. I am sorry to say that I have been unable to find a vegan alternative that compares in benefits to bone broth. I welcome any information to the contrary, especially in regards to healing the gut. If bone broth did even one of these things, it would be well worth taking it. There is compelling evidence that it has a positve influence on all the above mentioned things. Pretty amazing, don’t you agree? In general, I find I feel better since I have been using it. Specifically, it has helped heal problems I have had with digestion and gut issues. I would often not feel very well after eating, suffering a plethora of symptoms as varied as bloating and gas, indigestion and intestinal discomfort, and things such as lethargy and tiredness. This doesn’t happen very much anymore and I attribute it to my taking bone broth. There is science behind this claim….basically, key components in the bone broth like gelatin and cartilage mend the lining in your intestines that has been damaged by gluten, drugs, (both prescribed and over-the-counter), smoking, and alcohol consumption, and stress. If you have any issues with leaky gut, IBS, gas or bloating, or indigestion you owe it to yourself to implement this ancient but effective treatment for these gut related issues. I now have almost no problems with aches and pains in my joints, where I used to feel twinges somewhat regularly. In particular, I have a RSI in my neck and shoulder caused by 20+ years of being a Sports Therapist. It does flair up from time to time after a busy week, but not nearly as often as before and not nearly as severe. I also used to have a niggle in my right hip and knee that is absolutely, 100% gone. I am not sure if I “look younger” or not – that is not why I started taking bone broth – but think my facial skin is clearer and brighter. Here’s the thing: Bone broth is so inexpensive, and it is natural and risk free. So it will be so easy for you to try it yourself and let your body be your laboratory to test it out. You have nothing to lose and much to gain by this experiment. I know that sounds like a long time, but it is necessary in order to leach all the goodness out of the bones. You want all the minerals, gelatin, and cartilage to end up in the broth you will be eating. Most people new to bone broth do not simmer the bones long enough, and it can make one nervous to leave the bones simmering for that long. Just be sure that the broth is on a very low setting and the water covers the bones. You’ll just have to do it once to see that it will be ok! Let the broth and bones cool a bit when they are done, then strain the broth into containers with a colander or sieve. Important step: Let the broth chill in the fridge for a few hours before you plan to use it, so you can easily lift off all the fat which will come to the top when cold. You will notice that the broth is no longer a liquid, but is very gelatinous. This is a very good sign. It is not necessary to sip the broth plain, but I do exactly that because I think it is better for my gut. This is not necessarily true, but again it makes sense to me to do it this way. 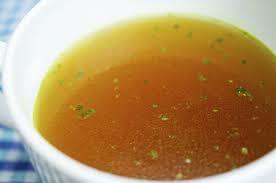 You can use your broth for soup stock, to cook rice, couscous, or quinoa, or to cook other foods with. Feel free to try this and let me know about your results. As mentioned above, if anyone knows of a vegan alternative that has all the benefits of bone broth (including mending tiny openings between intestinal cells) please let me know. This entry was posted in Health, Nutrition, Uncategorized and tagged Bone broth, heal your gut, natural rememdies on November 30, 2015 by cegenevie74. I really start to miss eating salads this time of year, but the usual summer salad greens are nearly always disappointing during the winter months with their bland taste and texture. Here is a salad that will not disappoint! It is made with raw kale, and no – it is not bitter at all. Some of you will not need any convincing to try this, but for those of you who are in the “raw kale is too bitter” camp, I urge you to give it a try. It is yummy! Mix the dressing ingredients together and whisk. 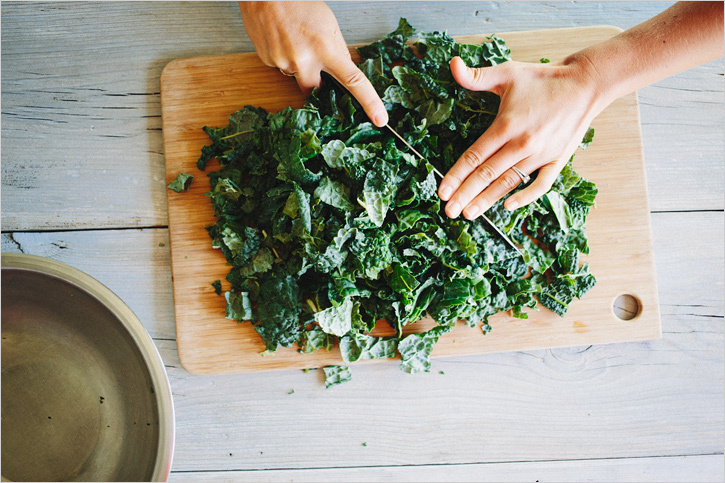 Pour over the chopped kale, blending well Add cheese and pumpkin seeds, and….ENJOY! I have eaten this salad immediately after I make it and it is very good. But if you want to soften the kale leaves a little bit before you eat it, simply dress the salad an hour or two ahead of time and the acid in the vinegar and mustard will make the kale less chewy. A very forgiving recipe….I have used more parmesan cheese and pumpkin seeds when I am using this salad as a meal and it made it very substantial and filling. You can also use more or less dressing of course. This entry was posted in Health, Nutrition, Recipes, Uncategorized and tagged healthy eating, Kale, salad, super foods on February 6, 2015 by cegenevie74. The most important thing a person can do to upgrade their nutrition is to give up processed foods. There is little chance of being healthy if your diet has too many packaged, processed foods on the menu. If this is the case for you but you are willing to learn new ways of eating and are also willing to make some lifestyle changes, then improved health is within your grasp. If you know little or nothing about how to eat healthy, start by eliminating all the processed foods then begin to increase your intake of vegetables, and you’ll be closer to better health almost immediately. Once you eliminate the processed stuff, you can focus on adding in more of the healthy plant-based foods to your diet. Set a challenge for yourself to prepare some healthy but delicious recipes, featuring plants or mostly plants. Experiment and explore with new and different recipes. There are so many blogs and free sources to get new recipes that you could get started as soon as you make your next trip to the grocery store. (A good way to boost your veggie intake fast is to get organic green super food powder (this contains freeze-dried or dehydrated vegetables and super foods), mix it with a little water or apple juice and a sprinkle of cinnamon, and start drinking it most mornings. It is a relatively pain-free way to get more veggies in you! Then continue your quest to find mouth-watering vegetable recipes. Once you make a start in the healthier direction, make it a priority to educate yourself and allow this interest in being healthy and feeling wonderful to motivate you. There are some great teachers in this area out there, like Mark Hyman, M.D., Josh Axe, M.D., Sara Gottfried, M.D. (“Dr. Sara”), The Food Babe, and Kris Carr, to name just a few. Once you begin, you will be amazed at the help and good advice at your fingertips. The key is to begin….right now, right where you are. Remember to put your focus on the plethora of foods you CAN eat, instead of the things you cannot. If you build your diet on what you must stay away from, your willpower WILL cave in time! Ask yourself the question, “What great foods can I add to my diet?” Stop thinking “no, no, no” when it comes to food, and instead make a list of healthy foods you like and have fun creating new meals. Remember that you want to get it right more often than not. No browbeating yourself! Just start incorporating some healthy yummy food in your diet today. Protein at every meal, plant based most of the time. If you like meat too much to give it up, pay the extra for organic free range meat. There are too many antibiotics, hormones, and chemicals in mass-produced meat to eat this way any longer. Lots of vegetables, some raw. Fruit, but limit the high sugar-content fruit to every other day (bananas, pineapples, mangos). It is simple, and not at all boring once you get out of the box and explore the possibilities of lovely food you may not have previously considered. If this seems too much all at once, decide to start with one day a week that features healthy and meatless food, and let your creativity run wild. There are some unwavering truths about healthy eating, then there are lots of opinions floating around out there. It can be confusing to read and hear so much conflicting information….Eat whole grains; avoid all grains – raw food is the way to go; raw food is not sustainable and rots your teeth – use lots of extra virgin olive oil; oh but it’s bad to cook with it (and maybe don’t eat fats very much any more!). I think the “truths” are to make your diet more plant-based, don’t eat genetically modified foods, and stay away from white sugar and white flour. At least, these are the truths to which my research has led me. I’m sure there are others out there who would disagree. The important thing is for you to find what is the best diet for you. (No, it’s never going to be doritos and snickers bars, sorry). But you have some wiggle room as to what is acceptable. I took a long time to realize that wheat and gluten was tearing my gut apart – mostly because I didn’t want to know this. Now I know, and as painful as it was to give up wheat, it is now part of my life and is relatively easy for me. In summary: give yourself the tools you need to get started by doing a little research, collecting tasty recipes, and adding great food to your pantry and fridge. Don’t beat yourself up by placing your awareness on what you cannot eat; just begin to crowd the bad stuff out of your diet by adding in the good. Enjoy the daily pleasure of healthy, living food. This entry was posted in Health, Nutrition, Uncategorized, Well-being and tagged healthy eating, Nutrition, plant-based diet on February 1, 2015 by cegenevie74. I found this recipe on an old receipt that I had obviously scribbled down in a mighty hurry. I have no memory of the origin of this recipe, having found it in a handbag I hadn’t used in a while. But I have tried it a couple of times, tinkering with the recipe each time (as I often do) and I think it is good enough to share. This serves two good appetites, so simply halve it if you are on your own. Keeping in mind that you are cooking the mushrooms in oil and there is oil in the dressing, you may want to drain the cooked mushrooms a bit – though I didn’t find this necessary. Mix crushed garlic clove and salt together; put this and all other dressing ingredients in a jar or small jug and mix together. Saute mushrooms and garlic in olive oil until mushrooms are nicely cooked through. Remove pan from heat, and add the blue cheese to the mushrooms so flavours intermingle. Divide the washed spinach on two plates or bowls, and drizzle the dressing lightly over the leaves. You can add a little sea salt and black pepper at this stage if desired. 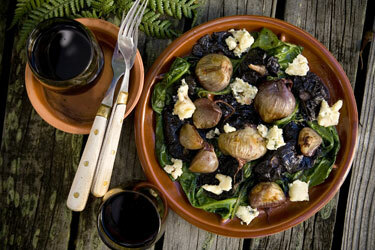 Put the mushrooms/blue cheese atop the leaves, and voila! Quick lovely supper. You can add your own little touches to this – I have used a mixed greens mix instead of spinach,and I love a bit of tomato (in season) on top. For you non-vegetarians, you can sprinkle some leftover bacon or ham in the mushroom/blue cheese mixture. This is a perfect vehicle for experimentation: Try adding strawberries or pears, black olives or avocados, substituting the blue cheese for feta cheese – the possibilities are endless. Experiment and enjoy! This entry was posted in Nutrition, Recipes, Uncategorized and tagged Blue Cheese, healthy eating, Mushrooms, Quick suppers, Salads, Spinach on October 4, 2014 by cegenevie74. Can Salt Be Good For You? I’ve suspected that salt has been given a bad rap for a long while, and have been happily digging into research that convinces me this is true. I freely admit that I enjoy salt and have always been reluctant to give it up, but I am more motivated by wanting to get to the real truth about whether salt is as bad as “they” say it is. This popular fear of salt and subsequent desire to consume less salt has led to a huge “low-sodium” segment of the food industry – as you know, the food industry is always happy to cooperate with our fears and desires. The low sodium industry is now big business, but unfortunately, the low salt foods they produce are often laced with MSG or other unhealthy additives to achieve the flavour without the salt. The rule of thumb to remember is to avoid or minimise processed food – whether it is high in salt content or low sodium. Dietary advice is often confusing and even conflicting as you know; we have been told to avoid salt, eat whole grains, stop drinking coffee, stop eating egg yolks, eat a low fat diet and that GM foods are safe as organic foods, to name just a few untruths. By listening to all this wise advice on healthy eating, we should all have got quite healthy by now. But we’re not necessarily healthier at all by following the mainstream advice, including the advice to limit salt. The truth is, many of us that are very health conscious have wised up to the fallacy of a low fat diet with lots of whole grains being healthy – along with a myriad of other untruths we’ve been told along these lines – but many of these same people that have “wised up” still agree that salt is unhealthy. And these people would be 100% correct if we are talking about the chemically produced table salt that is being sold on the grocery shelf and added to most processed foods. The table salt sold in shops is 97.5% Sodium Chloride, is chemically produced and heated to 1200 degrees F, bleached, and devoid of all nutrients. In many cases, it contains aluminium hydroide (which has been linked to many problems in the body, including Altzeimers Disease). It also contains about 25% chemicals, such as compounds designed to absorb moisture. This common type of salt is not naturally occurring and it is important to note that salt-water fish will die if placed in salt water made with table salt. It is indeed a very wise health decision to avoid this kind of salt. If you have it in your house, stop eating it immediately….the stuff really is toxic. (You don’t have to throw it out though; you can use it for natural cleaning and stain removal around the house. If you live in a cold climate, sprinkle some of it around your door steps in the winter to keep ice from forming.) Just don’t ingest this stuff! Real salt, in its natural and unadulterated form, is not only necessary for your body to perform normal functions, but is critically important in the right concentration for optimal health. Real salt does not contain toxic additives (such as aluminium), is not bleached or heat processed, and is rich in minerals (up to 84 different ones) that can be difficult to obtain otherwise. Table salt and authentic sea salt are two very different foods and it is important not to confuse the two. A major flaw in many of the studies done on salt consumption is that table salt, not natural sea salt, was used in the research. Now there is a somewhat large body of evidence showing that salt consumption is harmful when no distinction has been made between the toxic, chemically created table salt, and natural “real” salt containing trace minerals your body needs. Most of these studies do not give us helpful information because of this. If you’ve been limiting salt in your diet for health reasons, it would be good for you to differentiate between table salt and the healthy, mineral-dense salt that is authentic and natural salt. The taste between the two is very different and without discerning between these two very different substances, you are missing out on a richer and more varied taste and nutrient level in your food. Perhaps you would like to do some research on your own; there is a lot of interesting information out there that is easy to access. (You can start with your own broad searches, but I looked at several articles that described some fascinating studies, and found information quite easy to access. In particular, you can look at an article in the NY Times – www.nytimes.com/1991/12/science, or perhaps a 2003 study on salt by the Inter-University of Graz, Austria). To buy good natural salt, you can go to health food stores, or try http://www.mountainroseherbs.com (USA), or perhaps http://www.maldonsalt.co.uk or http://www.cornishsalt.co.uk (UK). There are other good sources if one looks around, and though real salt will be more expensive than the chemical-laden table salt that is so prevalent, it does not have to be excessively expensive. You will use much less of the real thing and will notice a difference in the taste. Explore this a little, and reap the rewards. There are old studies (some more than 20 years old) that suggest sodium is not the culprit in high blood pressure, but deficiencies in calcium and magnesium are. In 1989, the London School of Hygiene and Tropical Medicine re-evaluated the link between salt and high blood pressure. This study involved 10,000 people in 52 cultures around the world. It involved participants whose diet was nearly salt-free, to ones who consumed vast amounts of salt. In this study, salt intake was not estimated. It was measured precisely with urine samples and obesity and alcohol consumption was taken into consideration. The remarkable findings of this study was that except in a few places with extremely low salt consumption, the amount of sodium in the diet was unrelated to the prevalence of high blood pressure. (It was the extremely low salt intake that was problematic!) Also worth noting is that although the high rate of hypertension in Western cultures has long been attributed to the people’s love for salty processed food, this study actually placed these countries (in particular, the USA) right in the middle of the world’s salt intake curve. It looks very likely that we have been blaming the wrong culprit in the high blood pressure epidemic. This entry was posted in Nutrition, Uncategorized, Well-being and tagged can salt be good for you?, health conscious, real salt on July 28, 2014 by cegenevie74. Raw honey is the nectar from flowers that is pure, unheated, unpasteurized, and unprocessed. All the natural vitamins, enzymes, phytonutrients, and nutritional compounds are intact and uncompromised. It is an alkaline forming food that is very different from processed, mass-produced honey (www.benefitsofhoney.com). All these wonderful components in honey are the very things that are destroyed in the pasteurization process of processed honey, and renders this commercial honey to the nutritional level of refined sugar. Raw honey has anti-viral, anti-bacterial, and anti-fungal properties. It promotes digestive health, helps strengthen the immune system, lessens or eliminates allergies, and is good for your skin (www.naturalnews.com). The benefits of raw honey do not stop there. It has been used to stabilize blood pressure, balance sugar levels, and has been used to relieve pain, calm nerves, and to treat ulcers. It is also an expectorant and anti-inflammatory. People – this stuff is really good for you! But only if you buy authentic raw honey. It is best to buy your raw honey from a local source to be sure it is truly raw, particularly if you are using it for allergies. With local honey, the likelihood is great that it will contain small amounts of the pollen to which a person may be allergic and will offer a homeopathic-like remedy for the allergy. Take the time to find a source that you can trace, because like many health related businesses that are somewhat unregulated, unscrupulous salespeople can sell processed honey and label it “raw” – at least in the USA. Remember that raw honey can crystallise – a process that causes the honey to appear lumpy, grainy, and thickened. Certain types of honey are more prone to crystallisation than others. Acacia and Tupelo honey tend to resist crystallisation and remain liquid better than some other types. Manuka and Lavender honey tend to crystallise very readily. The process of crystallisation does not affect the taste or the quality of honey at all, though it does adversely affect its appearance. So, please don’t throw your crystallised honey out; it has not “gone bad”. If the appearance bothers you, it is easily reversible by placing your jar of crystallised honey in hot water (40-50C, or about 100F). Remove the jar from this gentle heat as soon as the granules dissolve. Store your raw honey in a cool, dry place and make sure the cap is tight. Honey will absorb moisture from the environment if left uncovered, and moisture can cause fermentation and lessen the honey’s quality. Always scoop honey with a dry spoon, as any introduction of water content into the jar should be avoided. Raw honey is so good for you, yes – but can you eat too much? In a word, yes! Even the natural sugars in fruit are bad for you if eaten to excess. How much honey is a tricky question, and depends upon your diet and lifestyle. For instance, if you eat very little sugar and lead an active lifestyle you could eat lots of honey and it would remain very good for you. However, if you consume lots of sugary food and live a sedentary lifestyle, you would not want to consume so much. Excessive consumption of any food (including honey) is not a wise eating choice. But one sure way to healthier eating is to replace as much of your empty calorie table sugar with nutritious raw honey in your everyday food and beverages. You cannot go wrong using this tactic to integrate more raw honey into your diet. As a very general rule of thumb, not more than 10 teaspoons of honey (about 50ml) per day is recommended. This amount is not based on any medical point of view, but is based on advice from honey producers with good ethics and knowledge (www.benefitsofhoney.com). 1. Improves digestion – Use a tablespoon or two to counter indigestion. It does not ferment in the stomach. 2. Relieves nausea – Mix honey with ginger and lemon to counter nausea. 4. Exfoliator – Add one cup of honey to your bath and soak for 15 minutes. Then add one cup of baking soda for a further 10 minutes. 5. Improves diabetes – Raw honey increases insulin while decreasing hyperglycaemia. Add a little at a time to your diet and see how your blood sugar reacts to it. 6. Lowers cholesterol with normal use. 7. Improves circulation with normal use. 8. Antioxidant support – Raw honey contains antioxidants. 9. Can improve sleep. If you can tolerate dairy, have a teaspoon or two in a cup of warm milk before bed. 10. Probiotic support – Raw honey contains prebiotics whch promote the growth of good bacteria in the intestines. 11. Improves allergy symptoms – (if sourced locally). 12. Weight loss – (if you substitute raw honey for the white sugar in your diet. 13. Moisturizer – Mix a spoonful of raw honey with olive oil and a squeeze of lemon; use as a hydrating lotion. 14. Hair mask – Will help boost shine in your hair; mix a couple of teaspoons of raw honey with a couple of cups of water, rinse and style as usual. 15. Reduces inflammation in the body both internally and externally. If you haven’t yet discovered the benefits of raw honey, then I hope this article inspires you to begin integrating this wonderful food into your diet. If you discover any further uses, please write and let me know. This entry was posted in Nutrition, Uncategorized, Well-being and tagged alkaline forming, benefits of raw honey, raw honey on July 13, 2014 by cegenevie74. Keep Fighting For Your Limitations, and – They’re Yours!